By the 1720s, the rue du Faubourg Saint Honoré had become one of the most desirable streets in Paris and some of the finest hôtels particuliers to emerge from the Regency period were rising along it. The Charost family built No. 39 between 1722 and 1725. Their architect, Jean Antoine Mazin, was relatively new to fashionable house building but what he may have lacked in spatial ingenuity he made up for in more solid construction than most of his peers. The purpose of an hôtel particulier was to provide a number of separate apartments for the different generations and siblings of a family. 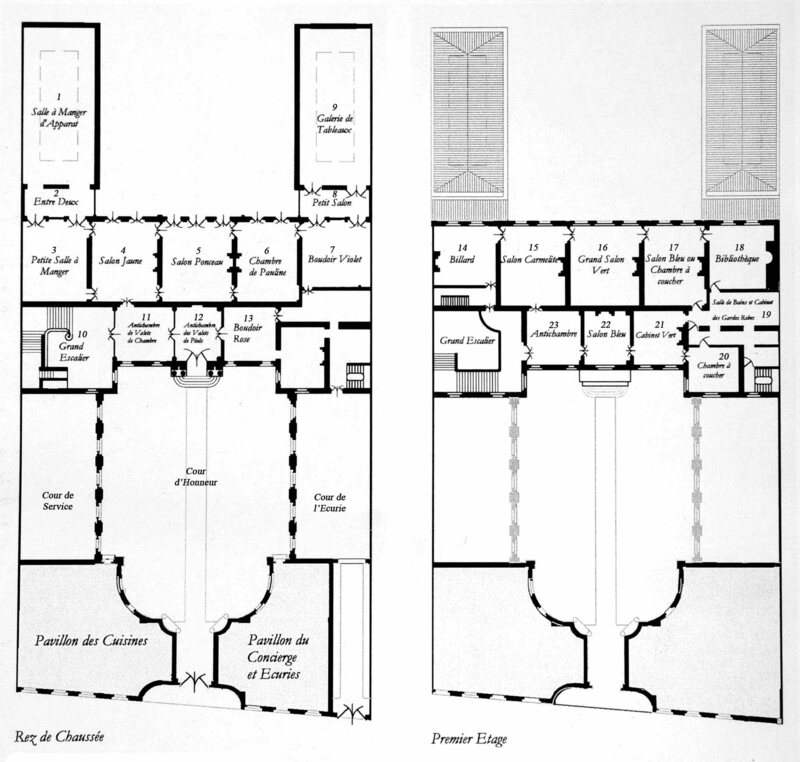 In the Hôtel de Charost, the largest and best apartment occupied the whole width of the house overlooking the garden to the south: it comprised an enfilade of chapel, ante-room, reception room, bedchamber and closet. The second apartment was directly beneath on the ground floor, and the third apartment lay along the north side of the first floor, overlooking the cour d’honneur. There were smaller apartments for the next generation on the second floor: they would move downstairs as vacancies occurred. There were servants’ rooms in the attics and stores in the basement. 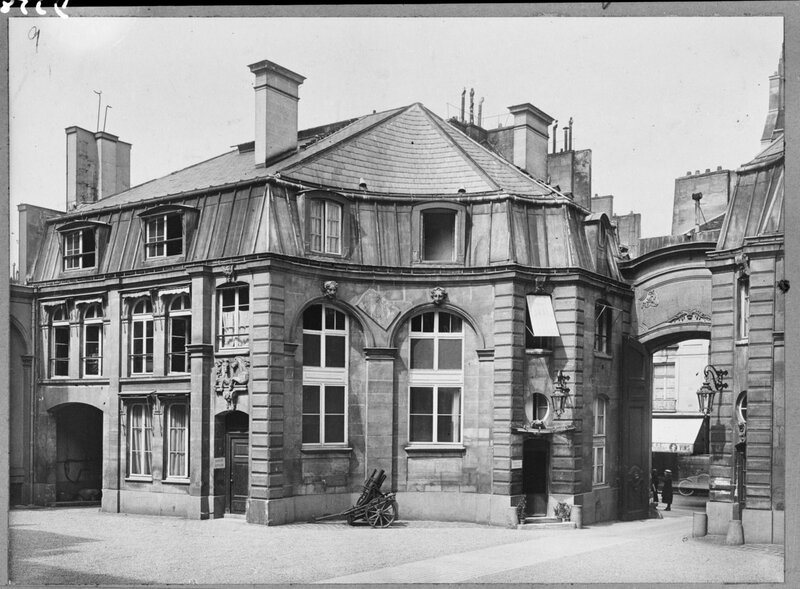 The house was approached from the street between two pavilions and across the cour d’honneur, which was separated from the kitchen and stable service courts on either side by arcaded screens of five arches each. The west pavilion, on the right upon entry, housed four carriages and about twenty-five horses on the ground floor, servants’ rooms on the first floor, and stores and haylofts in the attic. The east pavilion, on the left upon entry, contained the kitchen, its ancillaries and a smaller carriage house on the ground floor, and servants and stores above. Little was done to the house during its occupancy by successive generations of Charosts between its completion in 1725 and the family moving elsewhere in 1784. In that year, the comte de La Marck took a nine year lease on the house from the duc de Charost, and insisted that various works be done to make it more habitable and fashionable. These included enclosing the hall with entrance door and windows, substituting larger glass panes for the previous thirty-six lights in the majority of the windows, minor room re-arrangements, installing running water in the kitchen, and replacing the parterre with lawn. 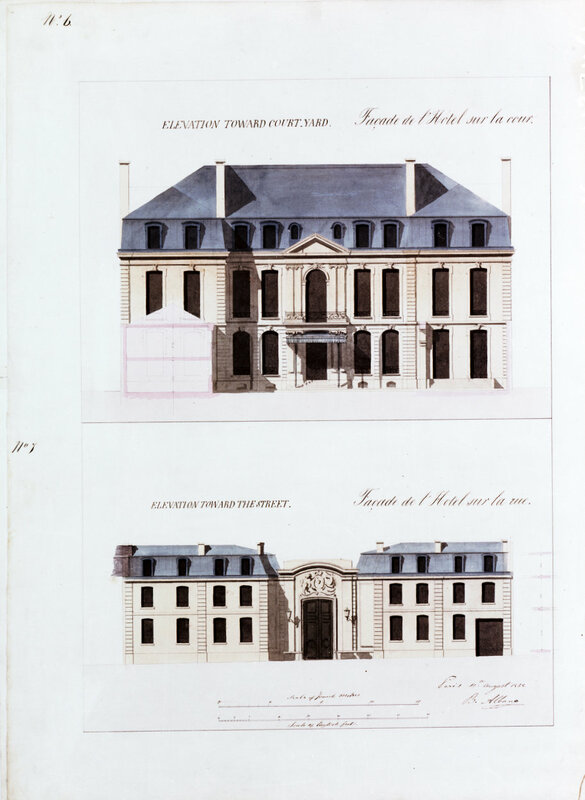 La Marck then commissioned, in 1787, an état des lieux, an inventory of fixtures, which ran to 220 pages and is an important document for the study of the history of the house. La Marck left France in 1792, sub-letting the house to the Portuguese ambassador, who died a month later. During the following revolutionary decade, periods of the house being unoccupied were interspersed with various short tenancies, including in 1803 to Lord Whitworth, the British ambassador. Later in 1803, the duchesse de Charost sold the house for 300,000 francs to Pauline Borghese, one of Napoleon’s sisters, just re-married to Camillo Borghese. With the proclamation of the First Empire in 1804, Pauline became an Imperial Princess and her house (re-named the Palais Borghese) became an official royal residence. With the aid of fashionable architects, Pauline transformed the interiors and furnishings of the house into a showcase of Empire style with the deep hues of the era and furniture commissioned from leading designers and craftsmen. In 1809, Napoleon paid off Pauline’s debts and settled a substantial income on her. She could now afford to commission the architect Pierre-Nicolas Bénard to enlarge her apartment on the ground floor by building two wings projecting into the garden, the eastern for a dining room to seat sixty people and the western for a picture gallery in which she hung 175 paintings from her Borghese husband’s collection in Rome. (He, when in Paris, was confined to the lesser of the two first floor apartments.) Besides these wings, which were hastily and rather shoddily completed in 1810, Pauline was most probably responsible for two structural alterations: the creation of a carriageway through the back of the west pavilion to connect the stable court to the street, and the insertion of ancillary kitchen and staff buildings into the kitchen court. Pauline herself lived comparatively little in the house and she never saw it again after she left Paris in June 1812. 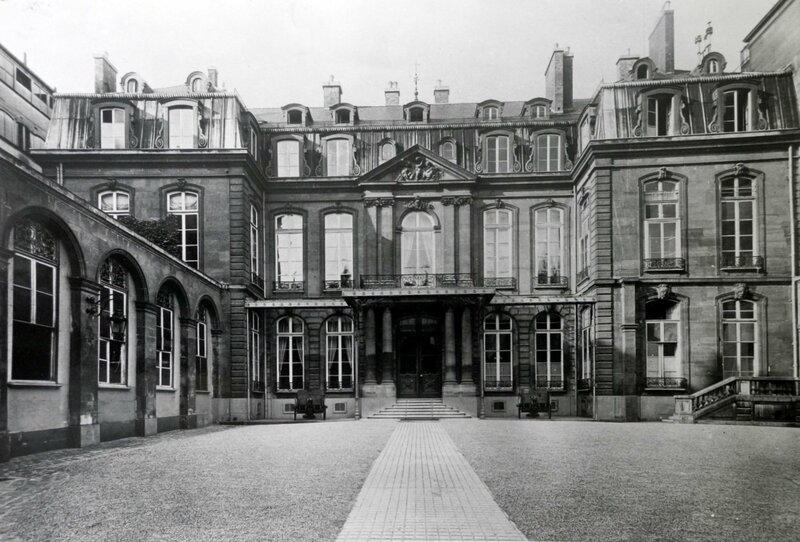 British ambassadors resident in Paris had for a couple of centuries rented their own embassy houses. Arthur Wellesley, newly created first duke of Wellington, proposed to break that custom when he was appointed ambassador to France in 1814. Wellington looked at several houses in Paris in June, some of them shown to him by Quentin Craufurd, a wealthy dilettante expatriate Scot. He liked best, but thought probably too large, 39 rue du Faubourg St Honoré which Pauline had put on the market because she doubted that the restored Bourbons would honour their promise to let the Bonapartes keep their property. 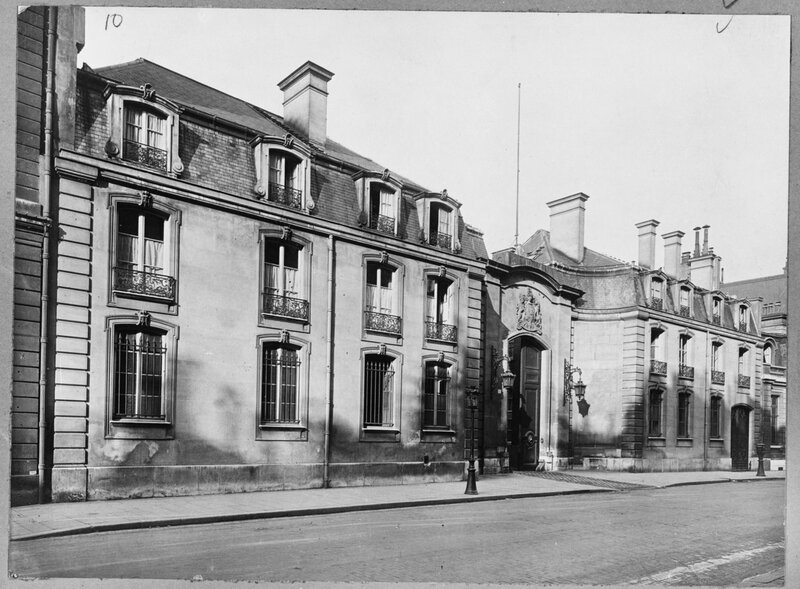 While briefly in London in July, Wellington arranged in principle for the British government to buy a permanent embassy house in Paris. Charles Arbuthnot, joint secretary to the Treasury and a close friend of the duke, almost certainly assisted in this arrangement. Wellington left it to Sir Charles Stuart, the minister in Paris, to decide which house the government should buy. Stuart, like Wellington, favoured Pauline’s house and appointed Quentin Craufurd to negotiate its purchase. Craufurd and Stuart were both connoisseurs and collectors and it was their recommendation that led to the inclusion in the sale of many of the house’s contents. Pauline was at the time in Naples, on the way to joining her brother on Elba, and relied on her Intendant General, J-PL Michelot, to negotiate for her. She wanted a million francs for the house, its contents and the leased stables round the corner on Rue d’Anjou, but was in a poor bargaining position. Craufurd negotiated Michelot down to 861,500 francs – 500,000 for the house, 300,000 for the furniture, and 61,500 for the stables (in total, about £46,500 at the time) and the principals accepted that figure. The deal was sufficiently done for Wellington to move into the house on the day of his arrival in Paris on 22 August 1814 and the purchase contract was finalised on 24 October. The purchase, which was made in several instalments, was funded by the king’s civil list and Wellington received the Prince Regent’s ‘gracious approbation of the terms of the contract with which you have entered in H.R.H. name’. Wellington only lived in the house for five months, during which he used it royally. He left Paris in January 1815 as British Plenipotentiary to the Congress of Vienna and in March, after Napoleon landed back in France, went to Brussels to assemble an Allied army. The embassy house was put into the care of the bankers, Perregaux. The battle of Waterloo was in June; Stuart returned to Paris as ambassador and re-opened the house in July; Napoleon went into exile in August; and Wellington became Commander-in-Chief of the Army of Occupation in October. For the three years of this appointment, he lived close to the Hôtel de Charost in the house that is now the American embassy. He then returned to politics in England. 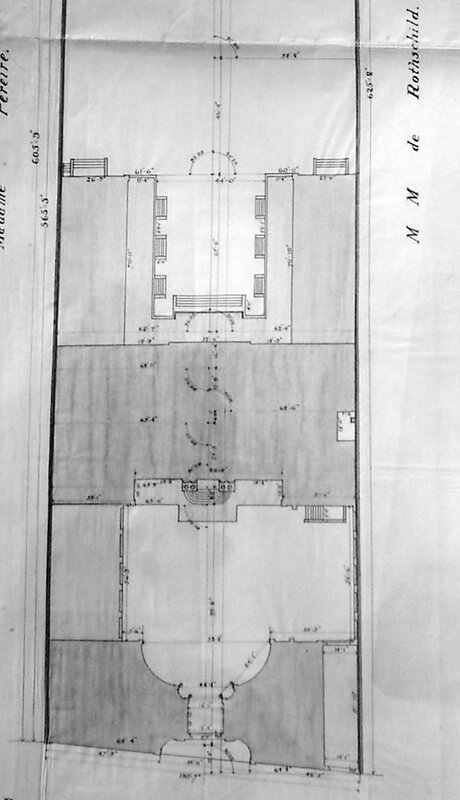 1907 record plan of site of 39 rue du Faubourg St Honore (North to the bottom). The site averages 35 metres in width: the garden runs 130 metres to the south. The two pavilions facing rue du Faubourg St Honore, with entrance between, 1964. The West Pavilion, with rue du Faubourg St Honore visible through open gateway, 1964. House frontage from cour d’honneur, 1954. Diagram of ground and first floors in 1814, with room names. (The numbers refer to key in Part 2). Elevations drawn by Benedict Albano in 1852.